I’m hap­py to intro­duce my guest, Lois Win­ston. Her new book is A Stitch To Die For. (I absolute­ly love the cover—and the excerpt.) She answered a few of my ques­tions. I know you write in more than one cat­e­go­ry. Do you have a pref­er­ence of one over the oth­ers? I start­ed out writ­ing roman­tic sus­pense, but I real­ly found my voice when I switched over to writ­ing humor­ous first-per­son novels—initially in chick lit, then in ama­teur sleuth mys­ter­ies. I’m not a fun­ny per­son by nature. I either for­get or mess up the punch line of any joke I’ve ever tried to tell, but I dis­cov­ered I have a tal­ent for writ­ing fun­ny. Of course, humor is very sub­jec­tive, so not every­one “gets” my sense of humor, but that’s true of most things in life, isn’t it? Some peo­ple “get” you; oth­ers don’t. What inspired you to begin your writ­ing career? As cliché as it sounds, it was a dream. I usu­al­ly don’t remem­ber my dreams, but one night I expe­ri­enced a very vivid one that stayed with me. Every night for over a week the dream con­tin­ued, unfold­ing like the chap­ters of a book. 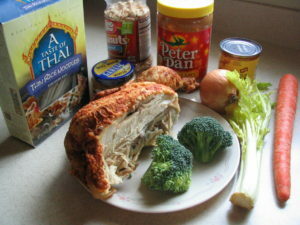 I final­ly decid­ed I need­ed to write down the sto­ry, most­ly to get it out of my sys­tem. When I had fin­ished, I real­ized I want­ed to keep writ­ing. By the way, that ini­tial sto­ry, after years of revi­sions, became Love, Lies and a Dou­ble Shot of Decep­tion, the sec­ond book I sold. Char­ac­ters and plots—are any of yours based on real peo­ple or real sit­u­a­tions? Does real­i­ty ever spark a cre­ative leap? Most of my plots are born from actu­al events I’ve read about in the news­pa­per or watched on the news. I’m a total news junkie. A Stitch to Die For, my lat­est Anas­ta­sia Pol­lack Craft­ing Mys­tery, incor­po­rates sev­er­al news sto­ries that have appeared over the past year—swatting inci­dents that are occur­ring across the coun­try and a cou­ple of court cas­es where chil­dren died from salt poi­son­ing. In addi­tion, some of my char­ac­ters have been based on peo­ple I’ve known. Lucille, Anastasia’s com­mu­nist moth­er-in-law, is based on my own com­mu­nist moth­er-in-law. The woman put me through years of hell. I’m now get­ting even. Lucille has become the char­ac­ter read­ers love to hate. 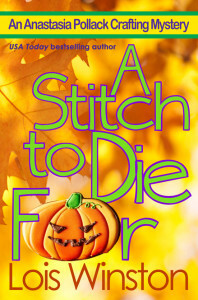 Now let’s talk about your new book, A Stitch To Die For. I love the cov­er for your new Anas­ta­sia Pol­lack mys­tery. Will you reveal a bit of a teas­er? Or more? Thanks! I’m real­ly thrilled with the cov­er, too! The adven­tures of reluc­tant ama­teur sleuth Anas­ta­sia Pol­lack con­tin­ue in A Stitch to Die For, the 5th book in the Anas­ta­sia Pol­lack Craft­ing Mys­tery series. Ever since her hus­band died and left her in debt equal to the gross nation­al prod­uct of Uzbek­istan, mag­a­zine crafts edi­tor and reluc­tant ama­teur sleuth Anas­ta­sia Pol­lack has stum­bled across one dead body after another—but always in work-relat­ed set­tings. When a killer tar­gets the elder­ly nasty neigh­bor who lives across the street from her, mur­der strikes too close to home. Cou­ple that with a series of unset­tling events days before Hal­loween, and Anas­ta­sia begins to won­der if some­one is send­ing her a dead­ly mes­sage. Two weeks ago my moth­er, Flo­ra Sud­ber­ry Peri­win­kle Ramirez Scoffield Gold­berg O’Keefe, took her sixth trip down the aisle to become Flo­ra Sud­ber­ry Peri­win­kle Ramirez Scoffield Gold­berg O’Keefe Tut­tnauer. The groom’s daugh­ter was a no-show. At the time of the cer­e­mo­ny her body was being fished out of the Delaware and Rar­i­tan Canal in Lam­bertville, New Jer­sey. Ira Pol­lack, my step­broth­er-in-law and the groom’s son-in-law, had just fin­ished a toast to Mama and Lawrence Tut­tnauer when two men in dark suits entered the back­yard cater­ing tent and head­ed straight toward him. Giv­en all my deal­ings with the police over the last few months, I eas­i­ly made them for detec­tives, a sus­pi­cion con­firmed when I spot­ted them flash­ing their badges. Ira nod­ded and fol­lowed them out of the tent. He and the two men made their way to the patio at the back of his house. I stopped at the entrance to the tent. The men stood with their backs to me, Ira fac­ing me. From my van­tage point I couldn’t hear their words over the con­ver­sa­tions and music going on behind me, but I saw the col­or drain from Ira’s face. He shook his head vio­lent­ly and yelled, “No!” loud enough for me to hear. I gasped, then led Ira over to one of the patio lounge chairs. He col­lapsed onto the cush­ion and buried his head in his hands as he choked out huge sobs. I turned to the detec­tives, wait­ing for more of an expla­na­tion, but both ignored Ira’s grief to fix­ate on the par­ty across the lawn. “What’s going on here?” one of them asked. Both detec­tives knit their brows togeth­er and glared at Ira. “Your wife doesn’t show for her father’s wed­ding, and you’re not wor­ried?” asked the old­er and taller of the two men. “And you are?” asked the sec­ond detec­tive, whip­ping out a notepad and pen­cil. “Why would you sug­gest that?” he asked. I shrugged. “I can’t imag­ine how Cyn­thia would land in the canal on her own. She isn’t…wasn’t the canal-strolling type.” Dirt and extreme­ly expen­sive design­er duds don’t mix. “What type was she?” asked the younger detec­tive. 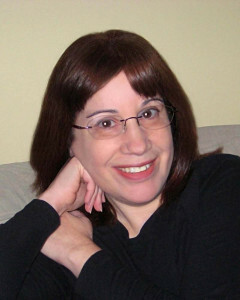 Bio: USA Today best­selling and award-win­ning author Lois Win­ston writes mys­tery, romance, roman­tic sus­pense, chick lit, women’s fic­tion, children’s chap­ter books, and non-fic­tion under her own name and her Emma Car­lyle pen name. Kirkus Reviews dubbed her crit­i­cal­ly acclaimed Anas­ta­sia Pol­lack Craft­ing Mys­tery series, “North Jersey’s more mature answer to Stephanie Plum.” In addi­tion, Lois is an award-win­ning craft and needle­work design­er who often draws much of her source mate­r­i­al for both her char­ac­ters and plots from her expe­ri­ences in the crafts indus­try. Vis­it Lois/Emma at her web­site and Anas­ta­sia at the Killer Crafts & Crafty Killers blog. Fol­low every­one on Tsu, on Pin­ter­est, and on Twit­ter @anasleuth. Sign up for her newslet­ter here.